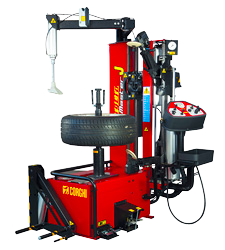 Superior quality teamed with a sleek design and other unique features allow this machine to achieve speeds up to 50% faster than any other tire changer on the market in its price range. 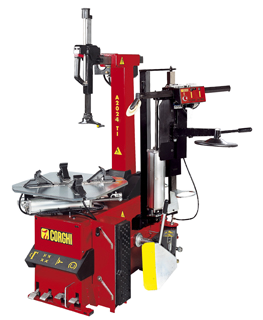 That’s why Corghi was awarded ISO 9001 Quality Certification, industry’s most coveted award. 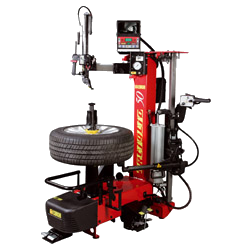 Run-flat certified by all major tire manufacturers. • Built-in table inflator with jets in the jaws. • Unique mount/demount head does not touch the rim during operation. • Locking handle locks head away from the rim. • Powerful action bead-breaker blade follows bead to inside rim contour. 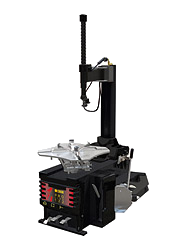 • Heavy-duty turntable rotates in either direction. • Rebuildable stainless steel cylinders. • Heavy-duty stainless steel turntable. • Safe, fast, profitable and affordable. • Upper arm assembly swings out-of-way. 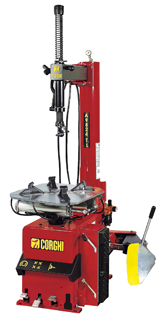 • Also available with air motor. Annuls all tension on the tire during the tire demounting/mounting phases. has this technology at its core offered in a very competitive price. A perfect synthesis between tested constructive quality, unique technological solutions and a competitive price represents the ideal machine and a perfect balance for an investment. Since 2001 this has guaranteed our customers a technological advantage that has remained unmatched over time. NOT ALL LEVA LA LEVA SOLUTIONS ARE EQUAL! And we are well aware of this.